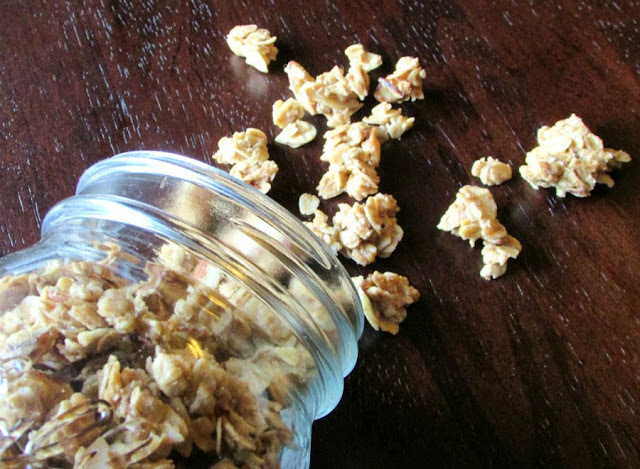 Jax and I have been having a lot of fun playing around with granola lately. It is nice to have a helper around when it comes to eating it. This stuff is addictive! Matt won't be much help with this one, as he doesn't eat nuts. Which is fine, it's more for me and Jax!! Preheat oven to 350 F. Spread oats on a rimmed baking sheet and bake for 10 minutes, or until toasted. Meanwhile, mix together almond butter, honey, vanilla and cinnamon. Stir in warm toasted oats and sliced almonds, then spread on rimmed baking sheet. Drop oven to 250 F. Bake for 20 minutes, stir then bake for 20 minutes more. Yes it is! My two year old has really taken a liking to granola in his yogurt, so we have been having fun trying different combinations. But I want to keep it small and fairly simple (and healthy) for him! This was perfect timing. I was currently looking for a simple granola recipe. I plan on making some today! 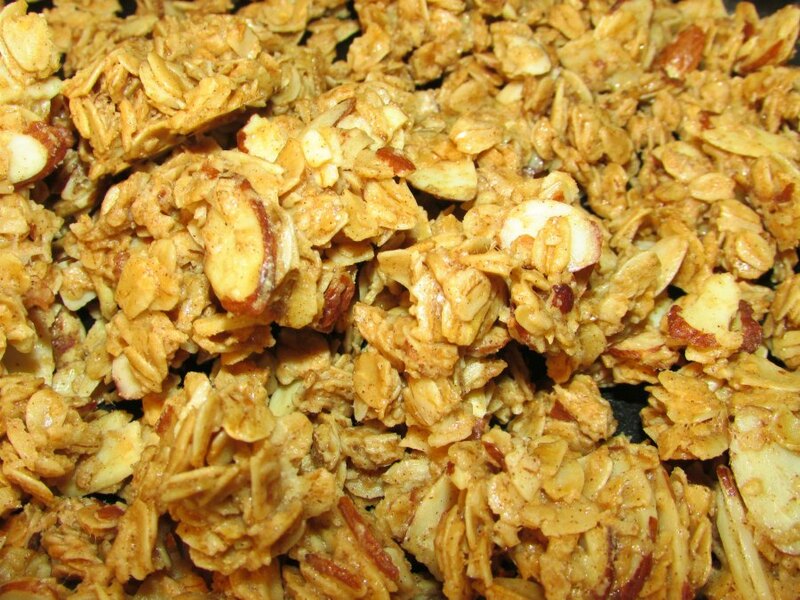 Your granola recipe sounds very good. I love granola over vanilla yogurt with blueberries. Granola, berries and yogurt definitely were made to go together! 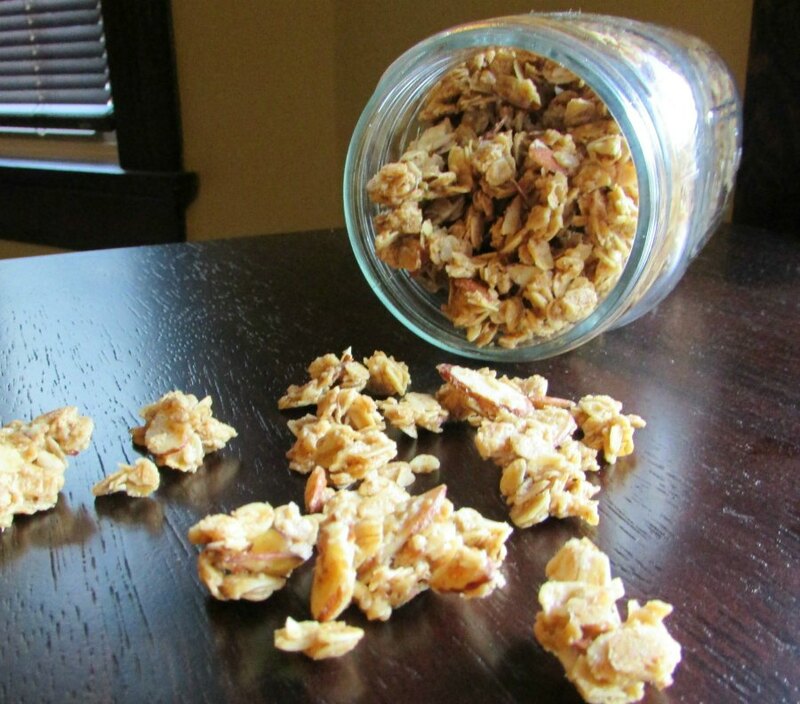 Granola's such fun - easy to make and modify, and yummy to eat. :) Thanks for stopping by and sharing this on Five Friday Finds! We have been having a lot of fun making different kinds lately! Thanks for hosting! Thanks for stopping by! It does seem like it should be possible to make gluten free versions. I hope you are able to make some! I love Granola but have never been brave enough to make my own. Thanks for linking up at #HomeMattersParty this week hope you will come back next week to link up again. It is easier than you think! Thanks for hosting, see you next week! Your Honey Almond Granola sounds mouth watering. Thank you for sharing with the Clever Chicks Blog Hop! I hope you’ll join us again next week! Thank you! We really enjoy a little granola with our yogurt. Thanks for hosting and I'll see you Monday! Love granola! So easy and versatile. :) Thanks for stopping by and sharing this recipe with us - you're featured this week on Five Friday Finds! Looks very morish!! Thanks for sharing with the #BlogFair.